If you don’t know how to start an email the right way, you’ve come to the right place. It’s a frightening thought: you could craft the perfect email but if your subject line falls flat, it will never be read. Luckily, we found patterns in what works and what doesn’t with subject lines when we analyzed over 115 million tracked emails. Below are our favorite lessons (and phrases to avoid), so you can perfect your subject lines and give your emails a fighting chance. BONUS: This tool shows you when your emails are being read. Want to know the worst way to start an email? Ask for help before you say hello. Why? Our guess is that no one likes getting put on the spot. It’s the reciprocity principle: people model their responses off of how they’ve been treated. Starting a conversation with a question is abrupt and demanding. You’re asking for their time and effort without offering so much as a hello. Why would they give something in return? 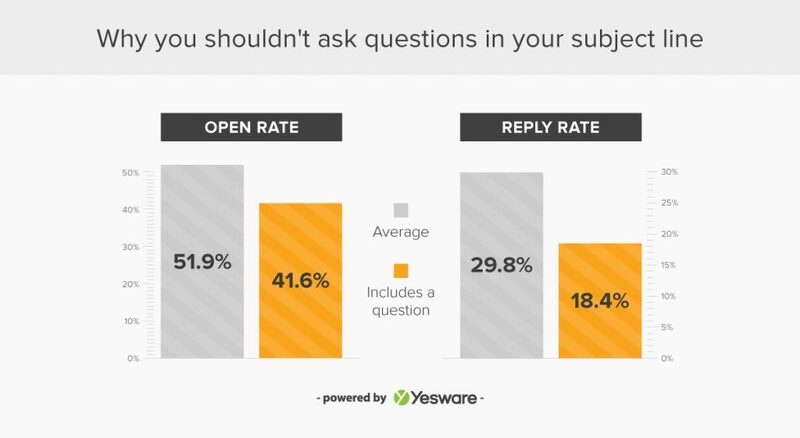 If you’d like to learn from your own email open and reply-rate data, we recommend taking a look at Yesware for Gmail or Outlook. Feel free to grab a free trial here. If the word “quick” is in your go-to subject line, you might want to rethink it. While “quick question” was by far the most popular two-word subject line used in over 910,000 emails sent by a whopping 3,146 companies, it’s also one of the least effective. You (hopefully) wouldn’t storm into someone’s office and start listing your demands. So don’t immediately launch into a request or question in your subject line either. A vague subject line (like “quick question”) can be annoying –and you don’t want to irritate your recipient when you need something. What to do instead: Be respectful of your recipient’s time by getting specific (and not immediately asking a question). Let them know why you just added another email to their already overflowing inbox. Try “check in” (69.9% open rate, 48.6% reply rate) or “next steps” (70.5% open rate, 49.6% reply rate). Get higher open rates with our new subject line data. 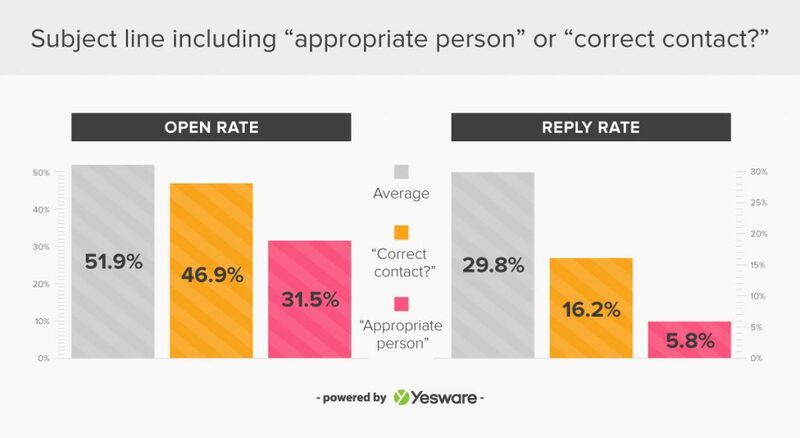 “Appropriate person” is one of the top ten most used two-word email subject lines, yet Yesware research shows it’s reply rate is six times lower than average. Using “appropriate person” or “correct contact” isn’t how to start an email simply because it undermines the recipient. Think of it from your recipient’s perspective: you receive an email that’s grasping at straws, asking you to do all of the work. No one would want that. If they aren’t the person you’re looking for, chances are they won’t do you a favor in passing you over when you made no effort. What to do instead: Find a decision maker (and their email address) on your own or personalize your email to the recipient. If you put in the extra effort for your recipient (even if they aren’t the right person), they could pass you to them. Asking a question in your subject line does more harm than good. 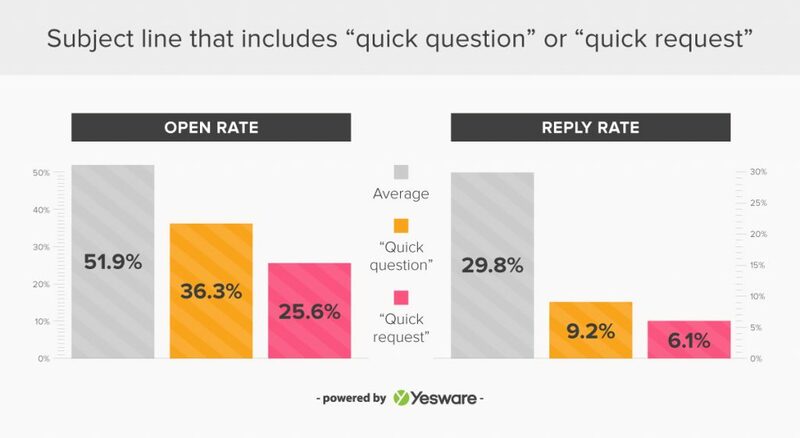 Go specific or go home: Using vague subject lines like “quick question” could decrease reply rates by as much as 20%. Don’t ask for the “appropriate person” or “correct contact.” Finding a decision-maker on your own is a much more effective way to stand out from the crowd.